Prof Dr Roshada Hashim, who was appointed as the Deputy Vice Chancellor of Research and Innovation, Universiti Sains Islam Malaysia (USIM) on 1st December 2016, expressed her appreciation for the opportunity to hold the important portfolio. This appointment has pushed her to be in the driving seat to spearhead research and innovation activities in USIM to a higher level in the global arena. She is also very optimistic and assertive on numerous potentials that USIM can utilise in order to be a respected, referred and relevant university. Q1 When you were appointed as the Deputy Vice Chancellor, how would you view this appointment in your career path as an academician? “I believe that as an academician, our career might not necessarily be at the peak when we hold a high-ranking administration position. To me, the absolute satisfaction as academician is when you are globally recognised and well-known, and the recognition is not restricted only in USIM or Malaysia per se”. “Therefore, I hope that researchers in USIM should play important role in the global arena, as we can see nowadays, the contribution, exploration and development of every aspect of knowledge, especially in Science and Technology, are mainly dominated by the Western researchers, in which, their views and discoveries are not always in line with the Islamic perspective”. Q2 What are the uniqueness and potentials of research activities in USIM? “In USIM, the uniqueness of research lies in the ability to conduct translational research, which is a research that can be replicated by community or society that have the integrated Naqli (the revealed knowledge) and Aqli (the conventional knowledge) values”. “The main challenge is to enhance our researchers towards that direction, so that their research is not limited around fundamental or applied areas. They need to think ahead about research that have the whole value change. This is the reason for the launching of the new strategic plan which is based on maqasid syariah”. “There are five elements in maqasid syariah that become the pillars in research activities in USIM. It begins from the relationship of human to Allah, and it moves on to how the research can give high impact to society”. “All in all, the contributions of the research can be benefitted by community and I believe that we can gain blessings by Allah and it will then be a priceless satisfaction to a researcher”. Q3 What is your opinion about commercialisation of research that can generate income? “Research and innovation can indeed contribute to significant income generation, as the saying goes, money makes money. If we spend sufficient amount of money for a high impact project, usually the income would be worth it. The Research and Development processes consume a lot of fund for commercialisation”. “USIM academicians also need to empower their consultancy, and in order to be a prominent consultant, they have to conduct a lot of research that can highlight their expertise”. 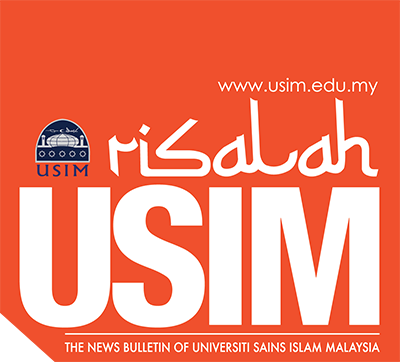 “For the time being, USIM focuses on consultancy and trainings to generate income. We do have our strong niche of research in delivering our consultation. But we still need to see that the products of research are based on maqasid syariah”. Q4 What are the arising matters and challenges in achieving the research missions in USIM? “75% of our lecturers are young, energetic and motivated to conduct high impact research and to be researchers but they are financially constrained. They are not experienced enough in securing big grants. Another challenge is, USIM itself does not have many professors who can be mentors to our young lecturers. We do actually have leading professors, but their numbers are not balanced compared to the younger counterpart. We are working hard to solve this issue and we usually get help from our professors, especially in certain areas that have a number of professors and experts. The professors have been very resourceful and helpful in assisting our young lecturers in conducting research”. “The next challenge is not only to convince other universities to work with us, but also foreign institutions such as UNESCO and many more. We need to convince them that what we are doing is not exclusive to the Muslim but it is relevant to all range of society”. “For example, if we classify an issue as Islamic Science or Islamic Banking, we brand them as a product that has Islamic value and syariah compliant. This is a huge challenge that we face when we try to promote a research which is based on Islamic perspective”. Q5 What is your hope and aspiration in the research activities in USIM? “I have high hope that our lecturers will play their active role as academicians in USIM. This is because university is the medium for us to expand the knowledge and disseminate it to others”. “University is like the seat of knowledge. University is not only a place to disseminate knowledge but it is also to generate more knowledge. I pray that USIM will be a continuously blessed university that can always generate and disseminate knowledge that is based on maqasid syariah”.